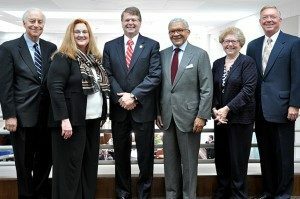 RALEIGH, N.C. – Judge William Webb, Senior Advisor to Shanahan Law Group, PLLC, collaborated as part of The North Carolina Commission on the Administration of Law and Justice (NCCALJ) to propose reforms aimed at strengthening and modernizing the North Carolina judicial system. The commission’s final report was presented to Chief Justice Martin on March 15, 2017 during a ceremony at the Supreme Court of North Carolina. In their report, the NCCALJ recommended plans for paperless courthouses, raising the juvenile age, reducing case delays, and assisting self-represented litigants. The commission volunteered more than 4,200 hours of service to this project researching, discussing, and gathering public input. “We at Shanahan Law Group thank Judge Webb and the entire commission for their dedication to finding positive solutions for the challenges facing our state’s judiciary,” said Kieran Shanahan, managing partner of Shanahan Law Group.